This was TWO of Monroe's better known landmarks. Hint: The four-lane highway in the foreground is US HWY 74 better known back in the day as "the boulevard". This aerial photograph was taken in the mid-fifties prior to the introduction of fast-food restaurants, super WalMarts, and multi-car families. Click on the picture to enlarge. Landmarks in this picture have been properly identified as Bundy's Drive-In Theater and Put-Put Golf Course. Click on "comments" under this post for more details. I know it is the drive-in theater (commonly called 'the passion pit' back then to many), but I do not think it was Bundy's since you (MB) said this picture was taken in the mid 50's. 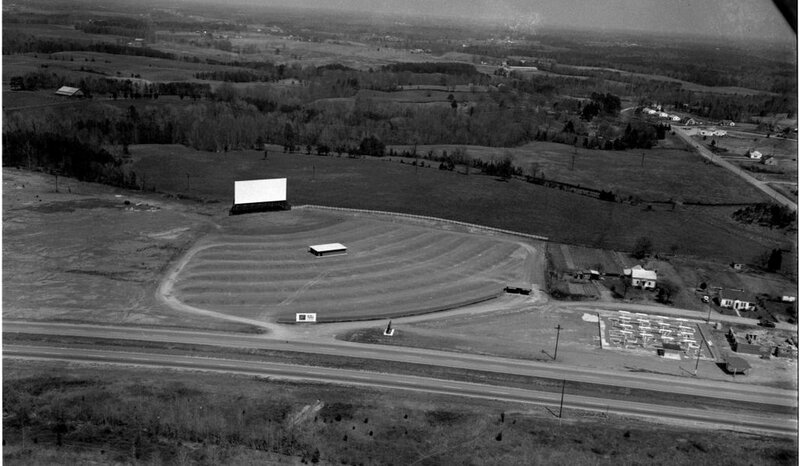 I can't remember the name of the other drive-in theater...but think it was on the 'boulevard' as was Bundy's. What was the name of other drive-in? RE: "photo taken in mid-50's"....I do rememer my parents taking us to the drive-in theater when we still had the old Oldsmobile car. I would have been about 7 or 8..so early/mid-50's..one younger brother at that time. Since I think one of the two landmarks you're talking about, to the right in the photo, is the "Putt-Putt" Miniature Golf Course......and I think that it was run by the Bundy family, then I'm thinking, MZ, that maybe that IS the Bundy Drive-In Theater next to it. 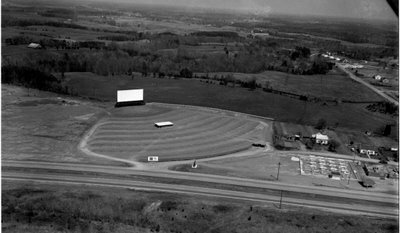 Was the other one, used more in high school days, the Monroe Drive-In?? (Or was there a "Starlight Drive-In"?? Marizell, your "passion pit" comment is 2-KOOL. I LOVE IT! Mary Eda, did you and Marizell attend astronaut training together or at separate times? YES!, this is the drive-in theater, hereinafter referred to as "the passion pit", and the put-put golf course. maybe someone has more details? Yes, I think the Bundy's were 'king and queen'or maybe 'his and hers' of the drive-ins! I know this was way back, but isn't it sorta odd there are no cars on 74? Highway = some traffic, even in the old days. BTW, why did John Gulledge take all these aerials? I thought the Bundy's had a bowling alley and swimming pool beside or close to the drive-in theater. Maybe they came later if, indeed, this is Bundy's drive-in. I don't remember the putt putt course at all. I keep thinking there was another drive-in further down the road towards Charlotte but before the overpass. I’ll join in for the sake of joining in but… I don’t have much information on drive-in theaters. It’s hard to find a girlfriend when you’re driving a junk-car, especially a junk-car equipped with a weak battery. My big thrill back in those days was roller skating. I ruled the rinks - Hatley’s and the other one down in Camp Sutton. Mr Hatley entered three of his best skaters in a statewide competition held in Concord – I’m thinking 1961? The kid I was skating against showed up with a monogrammed leather bag and pulled out a three-hundred dollar pair of roller skates. There I was, looking down at my rental-skates, thinking I might be in the wrong place. He really physced me out when he started those funny stretching exercises but, as it turned out, Mr Hatley was right all along – the kid was all show and no go. I was out there skating circles around him – backwards! We hauled home a HUGE trophy and I still don’t know if it was due to my abilities or Mr Hatley’s pep talk. Sorry guys, I know this has absolutely nothing to do with drive-in theaters or put-put golf but it’s the best I could do on such short notice. So nice to read your different comments about the drive-in theater. I do think it IS the Bundy's since the road to the far right has to be hwy 200. I do recognize the putt putt golf in the lower right side too. I had forgotten about it. Susan, you are right in that there were also the bowling alley and the swimming pool on that block of land. The bowling alley looks like it might be under construction in this picture. The swimming pool was built after the pool at the Monroe Country Club was closed...don't know that year, but I was sad when the pool closed. It was a favorite hang out of mine! Also, I agree with you about the other drive-in being a little ways up the boulevard and it was much older than Bundy's. Mary Faith, I also wonder where the cars were in this picture...none in sight! Maybe it was a Sunday when the Blue Laws were in affect and maybe few people out...?? Mary Eda, yes our family used to go to the drive-in,too, from time to time when Bobby and I were young. What fun! Jim, I loved hearing about your expertise in the skating world back then! And to hear of your being the champion in the competition was super! I enjoyed going to Hatley's rink on Concord Ave, and I continued skating with our 2 sons when they were youngsters! I would love to try skating again but feel it may be too risky now...but who knows! !